Newberry Architecture was founded in Houston in 1997 and has since completed projects across the country and around the globe. Its work can be found on the West Coast, in New York and Connecticut, and as far from Houston as Belize and Italy. Ken Newberry is the founding principal. He is an LEED Accredited Professional who studied architecture at the University of Rome in Italy and at the University of Houston. The firm offers feasibility studies and residential and commercial architecture services. Newberry Architecture received a Community Improvement award from the Houston Heights Association in 2013. Gina Brown, a principal at the firm, was given a Leader in Design award from the Houston Design Center in April. She joined Newberry Architecture in 2006 and has worked on projects featured in Luxe magazine and Architectural Digest. After Hurricane Ike destroyed the Jafarnias’ family home, they hired Newberry Architecture for the rebuild. The result was a 7,400-square-foot space with ample room for the three children. Newberry met the family’s request for more natural light with a glass panel that took up an entire wall and made the pool and back patio feel like an extension of the room. Newberry suggested melding the living and dining areas into one room, an idea the client appreciated later. A 1933 Mansion renovated by Newberry Architects was included on Architectural Digest’s list of “nine Texas homes where sophistication is key.” The building had elaborate trim and was set back behind gates, conjuring up images of an Old World estate. Keechi Creek Home Builders is run by a married couple and a third-generation carpenter. It’s a full-service design-build firm that helps clients through each phase of the home-building process. Brandon Lynch serves as the firm’s president, and Sheri Lynch is CFO. Tommy Strong, the carpenter for the firm, is also the project manager. Sheri and Brandon both attended Texas A&M University. Brandon is active with the Greater Houston Builders Association and chairs the Custom Building Council. He was named Custom Builder of the Year in 2015. Strong studied English at the University of Texas and has written for Remodeling Magazine, Professional Remodeler, and the Houston Chronicle. Keechi Creek Builders is a Better Business Bureau Award of Excellence Winner. A 10k-square-foot Teaswood Home in Conroe, north of the Woodlands, has everything required for a large family: four bedrooms, four-and-a-half bathrooms, a game room, a study, and a dining room, with a sauna for relaxing. The home design is contemporary casual, with a curved banister on the stairs, a large yard, and wooden, decorative furnishings in the restrooms and lounging areas. The house was certified Green Built Gulf Coast, a program by the Greater Houston Builders Association that recognizes environmentally sustainable building practices. A pool house addition by Keechi Creek Builders received the award for Best Specialty Room from the Texas Association of Builders in 2011. It was designed with a vaulted ceiling to be spacious enough for comfortable entertaining, while still feeling small enough for intimate conversations. Greymark Construction brings a practical approach to its architectural and design-build services. “We will not design something that can’t be built on budget,” the firm says on its website, “because we are the ones who will have to build the project for the stated amount.” Greymark President Leslie King studied business administration and management at Sam Houston University. Architectural expertise comes from Project Manager Courtney Doss-Lomas and designer Jorge Arreola. Doss-Lomas, a native Houstonian, earned her Master of Architecture at the University of Houston. Greymark focuses mostly on remodeling and design, but King has also advocated for Houston residents to be careful of scams during the labor shortage after Hurricane Harvey. Graymark has awards from Professional Remodeler magazine, the Texas Association of Builders, the Greater Houston Builder’s Association and the Better Business Bureau. Greymark Construction remodeled a River Oaks Home in the fashionable, upscale neighborhood. The final version had a black, winding metal handrail on curved stairs, black-accented, rectangular long-pane windows that opened onto a pool, and a long kitchen island with room for six stools to rest comfortably. Easy-open doors were attached to the entertainment area to quickly create an indoor-outdoor living room. Nonya Grenader has received the American Institute of Architects highest honor — inclusion in its prestigious College of Fellows, often abbreviated FAIA — a designation shared by only three-percent of its members. She is the principal of Nonya Grenader Architects, a small firm that works on residential and civic restoration projects. Sam Grenader joined the firm in 2014, six years after receiving his master’s from the Columbia University Graduate School of Architecture. Nonya Grenader has taught at the Rice University School of Architecture since 1994. She is a professor in practice and the associate director of the Rice Building Workshop, which focuses on affordable housing and architectural community engagement in Houston’s Third Ward. Grenader will receive the AIA Houston 2017 Lifetime Achievement Award at its annual December holiday party. Like many great architects, Grenader’s interest in design extends to her home, which received a Design Award for Residential Architecture from AIA Houston in 2009. The 1,800-square-foot house is raised with a pier-and-beam foundation, which gives it a treehouse feel, and adds privacy and flood protection. The house is linked by bridge to a small studio nearby, and allows for natural use of the elements with multiple rows of awning-style windows. An L-shaped home at 823 Shirkmere designed by Grenader was included on the Rice Design Alliance 2017 Spring Architecture Tour, titled “Living in Floodplains.” The house, in the deed-restricted Timbergrove Manor neighborhood of mostly ranch-style homes, had an elevated first-floor plate designed for buildings in floodplains. The main windows were configured to face north, which helped the L-shape maximize proper airflow, avoid excess heat from the nearby railway, and provide privacy for the backyard pool. GSMA was founded in 1996 as Glassman Shoemake Maldonado Architects, Inc. The name was later shortened to GSMA, but the firm’s ethos remained: to create unique buildings with personality. GMSA works on a variety of residential, civic, and commercial projects, with services in architecture, new construction, renovation, preservation, and design. Founding Partner Carrie G. Shoemake, FAIA, is a Leadership in Energy and Environmental Design (LEED) Accredited Professional and Houston native who attended the University of Texas at Austin. She was the president of the Rice Design Alliance and active with the Houston Design Sub-Committee and Museum of Fine Arts. GSMA has received 10 AIA Houston Design Awards and was AIA Houston’s firm of the year in 2013. GSMA constructed the second LEED Platinum residential home in Houston, called the Bluegate Street Home. The firm used efficient construction techniques — LED lighting, tankless water heaters, and a yard designed to avoid excessive water waste — to reach the added environmental standards. Its structural design was based on the owner’s memory of a childhood house. The Bluegate Street Home was included on the City of Houston Green Building Tour in 2013. 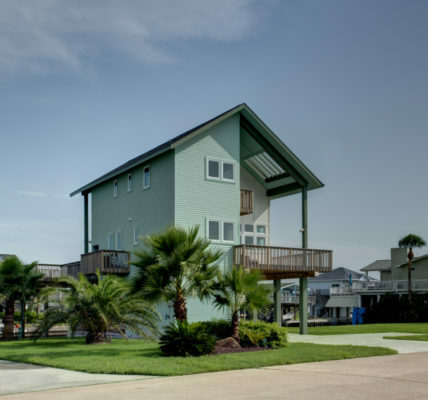 GSMA exhibited its capacity for custom design at the Terramar Beach House in Galveston. The client wanted something small, comfortable, and private. The firm responded with a modest, two-story home. Light blues and mild browns combined to form a natural, airy theme. The house frame was shifted to improve views of the sky and minimize views of neighboring homes. Shane Cook showed his firm’s forward-thinking stance on land-use when he built a Shipping Container Home for a family in the Houston Heights. Two containers, both gray, were stacked, with the top container longer than the other and based by metal beams to allow room for parking. The owners commissioned a local graffiti artist to paint a mural on the lower level for an authentically urban theme. The home won a Paper City Design Award in the Green Project-Use of Sustainable Products category. In a Montrose Condominium, Cook used his expertise in alternative living to help a client renovate a 768-square-foot space. Cook took out everything — right down to the drywall — except for the bathroom. The kitchen was elevated and porcelain tiles covered the floor. The bedroom was turned around, with an added privacy divider, to create extra space. A Bayou Residence by Lake|Flato was named the Architecture Magazine Home of the Year. The steel and glass structure hides in the dense greenery of its residential Houston neighborhood and is separated into three parts. Rolling panels allow the residents to reconfigure the space into smaller, intimate rooms, or create larger sections for entertaining. Wall-length glass panels allow for ample natural lighting within the two-story section of the building. The Bayou Residence won a Merit Award from the American Institute of Steel Construction. At a Bellaire Residence, the firm used white ceilings, domed lamps, and black, metal beams for a contemporary, youthful elegance. Light and dark brown tones complemented the thin, rectangular pool, while greenery climbed the short, concrete walls around the residence to mix with the lightly wooded yard. The architects at the San Antonio-based Lake|Flato believe that architecture should have a sense of place. They strive to create buildings that relate to the natural or built environment in which they are constructed, which shows through in their Houston work. Lake|Flato was founded in 1984. Today it has an 89-person staff that boasts 31 registered architects and 42 LEED Accredited Professionals. Six of its partners are AIA fellows. Ted Flato, FAIA, and David Lake, FAIA, are the founding partners. Flato is an active member of the AIA Committee on the Environment and focuses on sustainable design. Lake is an urban development enthusiast and Austin native who oversaw the opening of Lake|Flato’s Austin office. The firm has won over 270 architecture and design awards, including the Global Award for Sustainable Architecture and the AIA Firm of the Year award. It was named among Fast Company’s list of the 10 most innovative architectural firms in the world. Natalye Appel + Associates Architects is a small partnership founded in 1987. The five-person firm works on houses, civic projects, and offices. It was founded by Natalye Appel, FAIA. She attended the Rice University School of Architecture and is a regular presence around Houston. Appel recently designed a curved, concrete pavilion with enough room for a symphony orchestra in Levy Park, and she created an indoor-outdoor eating area and art car design for Houston’s Saint Arnold Brewing Company. Appel is on the board of the Hermann Park Conservancy and has served on the boards of the AIA, the Rice Design Alliance, and the Greater Houston Preservation Alliance. She is an LEED Certified Accredited Professional. Natalye Appel + Associates Architects was the Houston AIA Firm of the Year in 2012. The firm was awarded an AIA Houston Design Award in 2017. The 2,850-square-foot Cohen Residence in Houston Heights exemplifies Appel’s knack for creating indoor-outdoor spaces. The three-story home has the main living areas and master bedroom on the second and third levels, with large balconies that provide an excellent view of gardens on the base level. Guest bedrooms are on the first floor and have quick access to a covered patio and driveway. The Cohen Residence was included on the Houston AIA Home Tour in 2009 and the Houston Heights Association Home Tour in 2011. Natalye Appel + Associates reconfigured a Triebel-Gist Renovation for a client who didn’t want to tear down the historic structure. The firm removed all unnecessary material to simplify the floor plan and added recyclable metal roofing and high-quality insulation for energy efficiency. The Triebel-Grist Renovation received a Good Brick Award from the Greater Houston Preservation Alliance in 2010. Collaborative Designworks is a small firm staffed by lifelong architecture professionals. They offer construction, design, and planning services. The firm is owned by James Evans, who spent six years as an associate architect at Kirksey after working for Renzo Piano in Paris, France. Adriana Camacho, Benjamin Perry, and Matt Peterka round out the design team. Camacho received a Bachelor and a Master of Architecture from Tulane University and spent four years as a designer at Energy Architecture. Perry received his Master of Architecture at the University of Houston and worked on the Alley Theatre restoration during his tenure at Studio RED. The firm’s projects appear regularly on the annual AIA Houston Home Tour, and their work has been featured in the Houston Chronicle, Houston Modern Luxury, and Texas Architect Magazine, among others. Evans received the AIA Houston Young Architect Award in 2010 and the National AIA Young Architect Award in 2012. Collaborative Design Works showed its commitment to community planning and environmental preservation with House 1700 in Cherryhurst. The 4,357-square-foot home was designed around the location of a mature oak tree. The firm worked with the Houston Planning Department and the local homeowner’s association on a plan that made room for the tree and the building on the 5,000-square-foot lot by increasing the setback. Ipe wood siding covers the home’s second-floor exterior, while terraces and outdoor spaces were placed under the tree for a “modern treehouse effect.” House 1700 was included on the AIA Houston Home Tour in 2017. House 2045 was arranged for a client concerned about future mobility issues to allow for full access on one floor. The house employed few doors, with a design that relied on two intersecting, rectangular tubes. House 2045 was included on the Rice Design Alliance Home Tour in 2010 and received a Design Award from AIA Houston in 2006. StudioMET is well respected in Houston, and for good reason. The firm was AIA Houston’s 2016 firm of the year, and it received the Decorative Center Houston Stars of Design Award for Architecture in April. StudioMET was founded in 2007 and has remained firmly dedicated to Houston during its 10 years in business. It offers an architectural scholarship to students at the University of Houston, the University of Texas at Arlington, and Texas A&M University. The firm’s working philosophy is to approach each project as a unique endeavor, and to create timely, environmentally sustainable buildings that meld with their surroundings. StudioMET has three principals: Yoonchul You, Stephen Andrews, and Shawn Gottschalk. Yoonchul You has two Master of Architecture degrees, one from the University of Houston and another from Konkuk University in Seoul, Korea. Andrews received his master’s from the University of Houston, and Gottschalk earned his at the University of Texas at Arlington. The Houston Modern Architecture + Design Society hosts an annual Modern Home Tour that takes participants into that one house “you always drive by and wonder what it must be like to visit it, design it, or even live in it.” StudioMET’s Wharton Home was included on the 2017 tour. It uses wood and earth colors for a natural look that blends with the 5,000-square-foot lot in the Energy Corridor where it stands. Another tour-favorite from StudioMET was the Underwood Home, which was included on the AIA Houston Home Tour, featured in Modern Luxury Interiors Texas, and a semi-finalist for HGTV’s Faces of Design Award. The 5,500-square-foot Underwood Home mixes black, yellow, and brown color schemes with a gray, inset gabion wall and a two-island kitchen for a relaxed, suburban experience. A small, rectangular pool adds a luxurious finishing touch.